Calling all Native Artists ages 13-18! 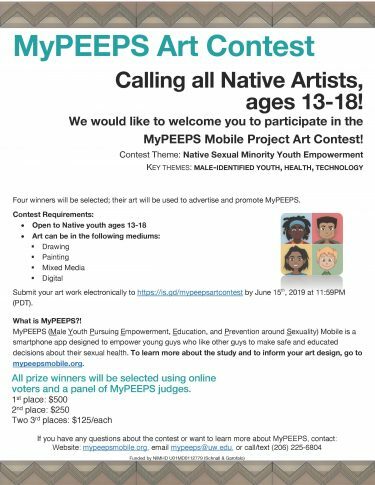 We would like to welcome you to participate in the MyPEEPS Mobile Project Art Contest! Four winners will be selected; their art will be used to advertise and promote MyPEEPS. Submit your art work electronically to https://is.gd/mypeepsartcontest by June 15th, 2019 at 11:59PM (PDT). All prize winners will be selected using online voters and a panel of MyPEEPS judges.